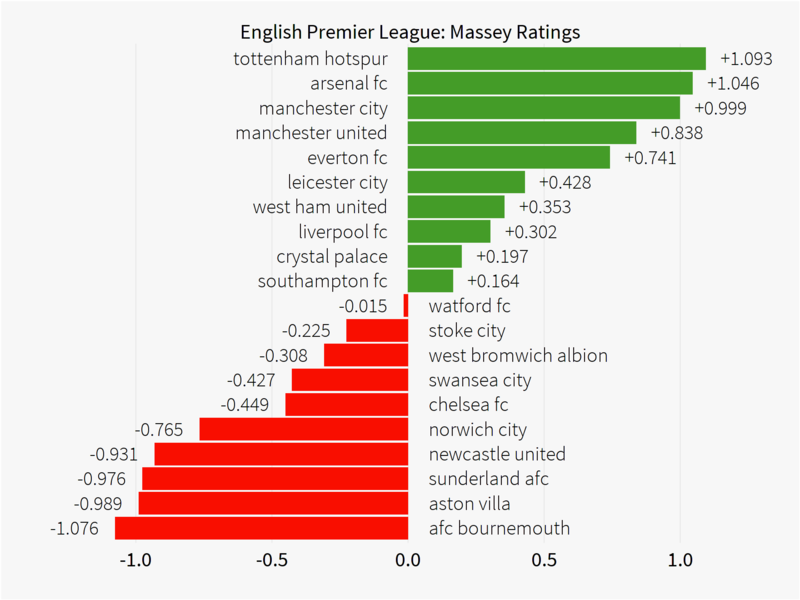 I've have explained the theory behind Massey Ratings on the blog before (here and here) but incase you haven't come across them, they are a way of rating teams that takes into account the strength of the schedule they've faced. Teams get an overall rating that can also be split into separate defensive and offensive ratings to allow you to see where team's strengths and weaknesses are. I've had quite a few requests to update the results from the previous posts so here are the team ratings for the English Premier League so far this season. At the time of writing this article Leicester City were top of the English Premier League after thirteen matches; however, Massey only has them as sixth best, suggesting their schedule may have been somewhat easier than other teams so far. 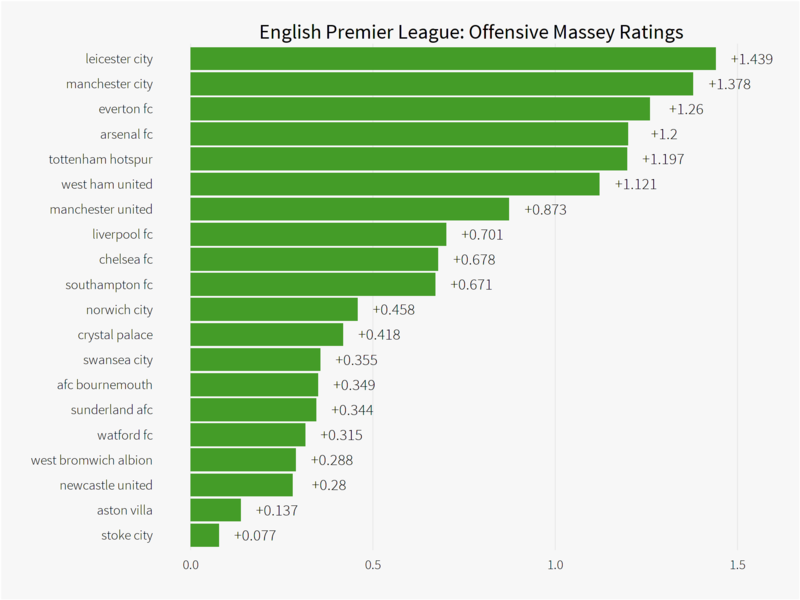 Massey actually rates Tottenham Hotspur as the best team in the league, slightly above both Arsenal and Manchester City so their promising start to the season is potentially even better than the league table shows. Poor Chelsea though are rated as sixth worst overall, similar in overall ability to Swansea City. 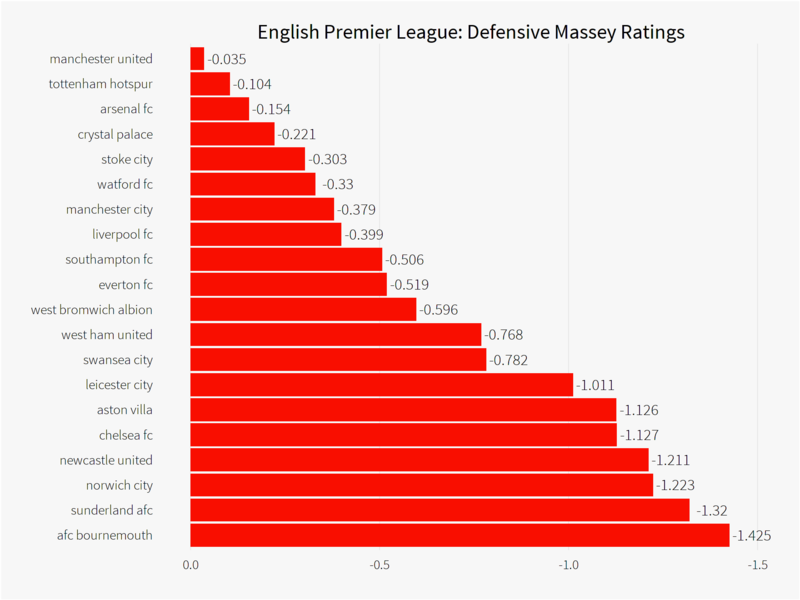 Their attack is doing okay, with a rating sandwiched somewhere between Southampton and Liverpool. It's their defence that is letting them down, with a rating even worse than Aston Villa's! I'll be posting updated Massey ratings throughout the season so it will be interesting to track how they change as the football season progresses.